Can you find the hidden letters? Do you have the Observation Skill to find any hidden letters in the group of other letters? Can you find the words hidden in the picture? or Can you find words hidden in the sentence? There are many such puzzles in which one has to find the hidden letters or hidden words in the picture. These puzzles tests one's visual skills or observation power. There are many such tests on this website which are designed to test your Observation Skills for finding the hidden letters or hidden words. Lets see many many of these test can you pass successfully? Below is the link to each of the test. 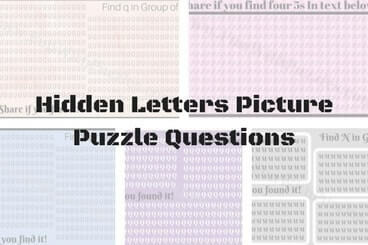 Click on the links below to open the corresponding Hidden Letters Puzzles' Page.